Wafer-like hoptree seeds were substituted for hops in early immigrants’ beer brewing. Back at the turn of the century, my workplace moved from Fort Parker State Park to Austin. I recall my first summer in Central Texas. On a friend’s recommendation, I trekked out to Hamilton Pool and Westcave Outdoor Discovery Center, famed nature preserves with grottos (collapsed caves) containing crystal-clear spring pools. Traveling between these preserves, you wind along Hamilton Pool Road, cross the Pedernales River and climb a steep hill. As my truck chugged upward, I was drawn in by the unusual wafer-like appearance (almost like potato chips) of the hoptree fruits as they dangled by the hundreds from the shrubs scattered along the shaded canyon slope. Hoptree, also known as wafer ash (Ptelea trifoliata), is an attractive deciduous shrub or small tree. Hoptrees can reach a height of 20 feet and have a central trunk up to 6 inches wide. Hoptrees are identified by their distinct shiny, dark green leaflets of three that range from 2 to 5 inches long. The plant is dioecious, bearing male and female flowers on different trees. The fruit (samara) is a distinctive disc-shaped wing resembling a wafer or potato chip. Hoptrees flower in early spring with greenish-white flowers produced in terminal branched clusters. Hoptrees are sometimes called stinking ash in reference to their unpleasant smell. The genus name of Ptelea is from the Greek word meaning elm, which indicates the similarities between hoptree and elm seeds. In Texas, German immigrants in the 19th century used hoptree seeds in place of hops for beer-making, leading to its common name. Hoptree is a great native tree that’s highly deer-resistant but does attract bees, wasps, flies and ants. Caterpillars of the giant swallowtail butterfly feed on the leaves. In Texas, hoptrees are found in the north-central, central and eastern parts of the state along with a narrow band in the southwest. 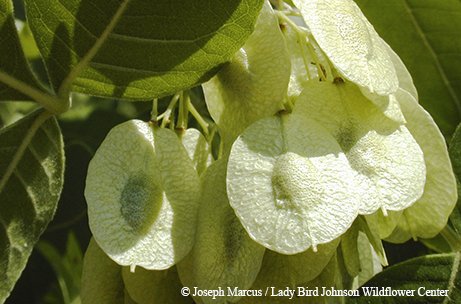 Plant enthusiasts can easily encounter this tree with its showy seeds throughout the summer and fall along wooded hillsides and in most state parks in Central Texas. I continue to look forward to the seeds of the summer fruiting of hoptrees just as I did on my first encounter above the Pedernales River. I pull over at least once every summer on my way to work along a little turnout on Onion Creek in South Austin to observe this majestic member of the citrus family. Check out the attractive wafer-like seeds when you are exploring Texas landscapes this year. Did You Know? Not just a beer ingredient, the hoptree is a favored host of the giant swallowtail butterfly.